PermaTrak North America is a designer and supplier of a concrete boardwalk system, which now relies on inbound marketing as the primary lead generation strategy for their growing business. When PermaTrak formed in 2010, the marketing and sales strategy revolved around cold calls, cold emails, existing networks, lead services that would deliver lists of upcoming construction projects, and expensive trade shows. The website was developed by another agency as a "digital brochure," to impress landscape architects and engineers, the primary audience. The site came out like a beautiful luxury car without an engine. It was built for looks - not performance. Like many small businesses, PermaTrak struggled with getting traffic to the website, as well as converting traffic into leads their sales team could follow up with. PermaTrak needed to get the word out that a concrete boardwalk system was an option for landscape architects and engineers to specify on their pedestrian bridges, trail systems and observation decks. The term "concrete boardwalk" really didn't even exist at the time! For a growing company with a new type of boardwalk material being introduced to the market, it became very apparent right away that the product wasn't the problem. Allowing people to "find" PermaTrak online, and increasing awareness that they even existed - that was the problem. It was time for a radical change. "Our standard process for updating our website was to call the marketing agency, describe what housekeeping changes needed to be made, review their work, pay the invoice, and repeat the cycle. A little inefficient to say the least!" The PermaTrak management team decided to invest in the www.permatrak.com website - their greatest marketing asset. Craft Impact demonstrated HubSpot's all-in-one marketing software and discussed how the previous site would migrate over to HubSpot from Wordpress. With access to a friendly software interface, PermaTrak immediately started saving time and money with the ability to make simple website updates themselves through the HubSpot portal. Instead of declaring PermaTrak's boardwalk system to be better than the competition, we offered blog articles that shared objective, educational information (such as cost information) we knew would be tough to find anywhere else. Instead of telling landscape architect and engineers that PermaTrak was the best option, we let them research the facts and figure out for themselves which product they should specify. According to research by HubSpot, most buyers want to get in touch with a salesperson only after they’ve researched and narrowed down their options into a shortlist. We published helpful content such as design details, installation guidelines, cost information, and comparison-based articles. Whether a visitor found PermaTrak's site through a Google search or otherwise, they could use it as a resource for commercial boardwalk design, cost or construction information. 47% of buyers viewed 3-5 pieces of content before engaging with a sales rep.
As a result of this commitment to inbound marketing, PermaTrak's primary source of lead generation is their robustly helpful website. Qualified landscape architects, engineers, and agency owners such as project managers at municipalities or counties download or request information from the website in exchange for their contact information. The majority of these leads are well informed about PermaTrak and have follow up questions for the sales team, such as specific design information or a budget estimate. 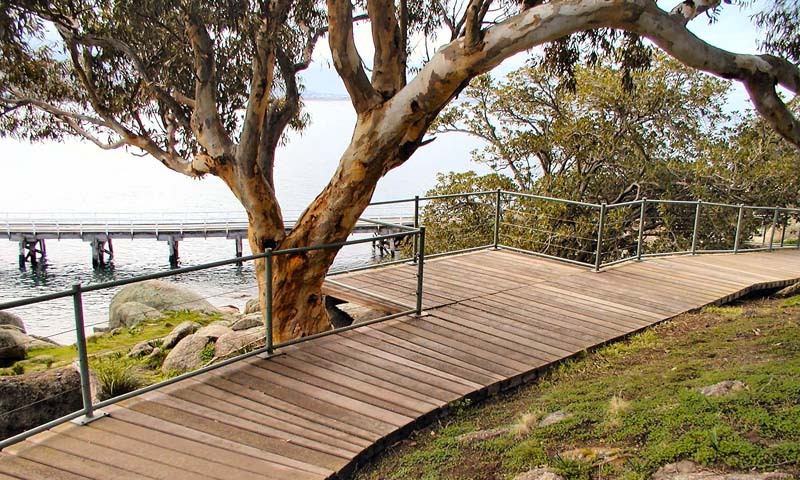 Others have come to the conclusion on their own that PermaTrak is the right solution for their pedestrian bridge, boardwalk, or multi use trail project. From there, the PermaTrak sales team further qualifies the lead, creates the opportunity and begins to work on engineering support for the boardwalk project. The challenge now is for the sales team to maintain consistent follow up with the steady stream of leads coming in through the website each day. Wouldn’t you like that to be your company’s challenge? Gone are the days of relying on "knocking on doors" to be heard or introduced as an option. Today PermaTrak's focus is on a comprehensive inbound marketing strategy, showing ROI on the monthly inbound marketing investment, and following up with the surplus of marketing qualified leads. Jul. 2016 - Feb. 2017; Now averaging around 51 leads/month.